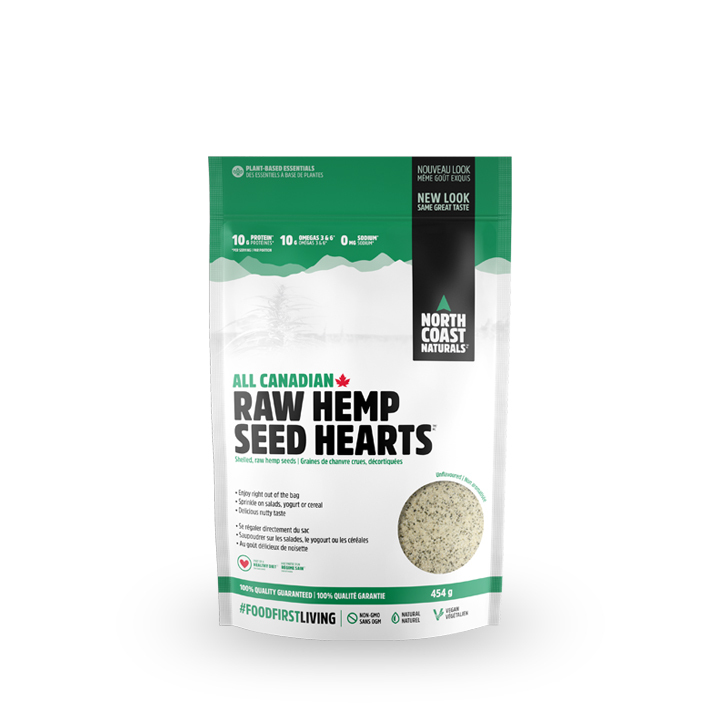 Each serving of All-Canadian Raw Hemp Seed Hearts provides 10 g of protein, 10 g of essential fats (EFAs), 2 g of fibre and an impressive 70% DV (daily value) for magnesium (290 mg). Hemp seed hearts are the heart of the seed; they are naturally gluten-free and easily digested, and have a delicious, nutty flavour. Super-convenient nutrition, right out of the bag. Raw Hemp Seed Hearts provide a whole-food plant-based option for those looking for highly digestible, low-allergenic nutrition. Low in saturated fat, they can be part of a heart-healthy diet. They make a convenient and tasty snack on their own or they can be added to cereals, smoothies, salads, yogurt, etc. to boost your protein and EFA intake simply and conveniently. Canadian, 100% raw, shelled hemp seeds.